PostADay2011 to the Rescue! – Happily After Retirement! DOES ANYONE KNOW I’M HERE? Tell me… do you ever wonder if anyone is reading your blog? Do they admire your photography, smile at your sarcasm or snort at your commentary? Does anyone read your words of wisdom? Do they learn from your lessons? 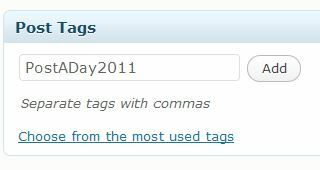 I just realized that I have an amazing opportunity to find new friends and read some good posts from others in the PostADay2011 Challenge. So, how about it? Anyone up for the 5 Visits a Day Challenge? Just think – if I only made one new friend a day – I would have 365 by the time the year is up, right? Previous Don’t miss a word of this! Yes! I love the Daily Post, even though I somehow feel that in this case, it would have been better to have a free WordPress dot com blog. I try to take part in the comments sections there though, so that I get my link out. I already visit many of the blogs. A few people have started coming to my blog. This way we get better exposure. On days when the words come out easily, I harvest them! I write 2-3 posts and schedule them for tomorrow and the next day, etc. That buffer allows my mind to roam freely and find new material in a leisurely manner! This challenge is opening up my world to new ideas, blogs, photos and such talented people! Yes, I’ve started to do it too … as soon as I think of something, I type it up as a draft and work on it later. It works very well, wish I’d come up with that much earlier. When I’m away from home, I do it on the cell phone. Nice post! I’ve received so much WordPress love today, I thnik I’m going to do as you suggest and comment more! We all like feedback. Keep it up! Do I count if I’m doing post a week? I decided that post a day was too much pressure, but I do post almost every day….just saying post a week makes me breathe easier. But I love your challenge to look at 5 other blogs a day. I love building this community. You never know what gems you might find! Alisa — it’s great to make blog friends – those who write daily, weekly, monthly – or whatever. This Postaday-2011 challenge is such a great way to meet other writers, isn’t it? And my blog reading lends itself to new ideas on topics to write on! HI Stacy – thanks for your comment. I think blogging buddies are a great idea. Shall we be BBBF (best blogging buddies forever?). I think we link to each others pages, comment, ask questions … borrow money (ok, maybe not) and that works fine for me. How about you? oohhh yes….lets be BBBF!! though I don’t have any money for you to borrow. ….but I’m good for links, comments, likes, etc. Dear BBBF — You’re my first and I’m loving it! Thanks. I’ve loved every minute of this postaday2011. I’ve found some lovely blogs – and here’s another. I agree! This has been a great way to get a vast amount of people writing, sharing and staying involved! And add some new friends, lessons learned and wisdom shared and it’s been a blast! Thanks for writing!!! I’m not sure I’m up to 5 visits a day, but I’ll start with one, and see where that leads! Thanks for the challenge! Shawn from http://www.shawnbird.com/blog Come on down for a visit! Hi Shawn! Thanks for stopping by. Getting out and visiting other Postaday2011 is fun and you’ll find some friends that you keep checking back with on a regular basis. Be sure to comment and let others know what you think of their words. Great to meet you!